Yesterday I saw people walking to market. There were women and teenage girls and younger carrying large bundles on their backs. . . many of them for several miles. Everyone walks everywhere they go. We are very spoiled in America. The horses that they have for pulling their carts look like walking skeletons. 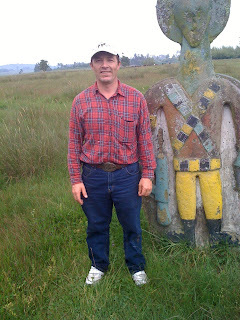 On the right is a picture of a statue that is right in the middle of the farm at Kokosa. It looks like a soldier. I will have to find out what it is doing there so that I can tell you when I get home. 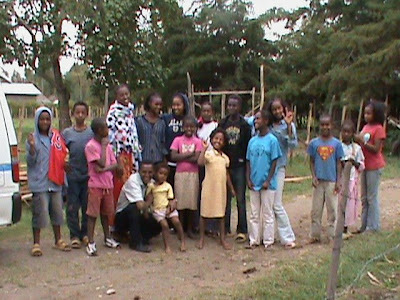 Below is a picture of the children from the Village of Hope, most of them are orphans. They work hard so they can have food to eat. Each one has their own little garden. Can I somehow get into your suitcase and come with you? This is what I want to do. God bless you guys/ Good job. Millie, if you visit the Village of Hope website, they have opportunities to donate or volunteer for excursions with them. Thanks for your support everyone!